Five days ago, the Trump International Hotel in Washington DC had an average Yelp rating of 4 out of 5 stars. As of today, that average had dropped two full stars after hundreds of reviews describing the hotel as a "s***hole" were posted with the lowest-possible one-star rating. Almost 800 reviews describing the hotel using the expletive were posted between Thursday and Monday, according to New Knowledge, a company that tracks the spread of misinformation online. The reviews follow reports that President Donald Trump had used the word "shithole" in describing African countries while discussing immigration with lawmakers last Thursday. Trump has acknowledged using "tough" language during the conversation, but says he did not use that word. "What a total 's***hole'... Run by a deplorable," read one of the comments posted on the customer review website on Monday.. Similar comments were also posted on the Yelp pages for Trump hotels in Chicago and Hawaii, as well as for Mar-a-Lago. As of the end of 2017, the president had spent nearly a third of his time in office at the private Florida club. One dubious review posted about the Trump International Hotel and Tower Chicago featured photographs showing a dirty bedroom and bathroom purportedly in the hotel. It was obvious at a glance that the photos were not from the hotel, and about two days later, the post was removed. 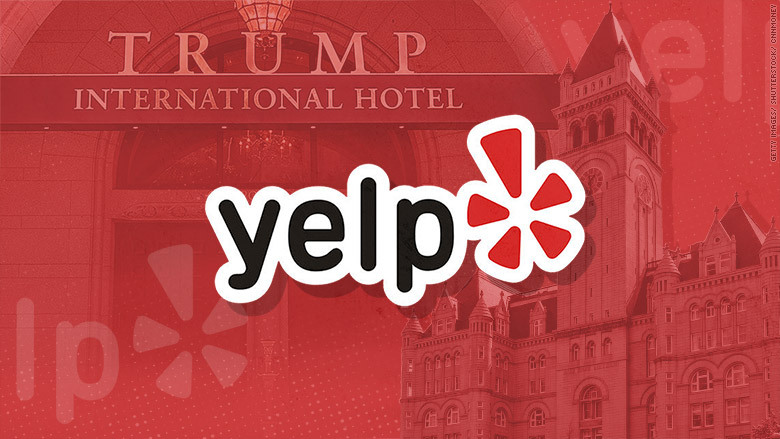 Yelp placed a message on many pages for Trump-owned or branded properties that read, "This business is being monitored by Yelp's support team for content related to media reports." A spokeswoman for Yelp told CNN, "these media storms are complicated situations that create a dilemma for Yelp, but we've chosen to take a strong and consistent stance on managing them." The spokeswoman said that reviews that are not based on firsthand experience violate the company's terms of service, but that due to the high volume of posts submitted during a "media storm," they can take a few days to remove. Ryan Fox, co-founder of New Knowledge, told CNN that some Twitter users were encouraging people to write fake reviews on Trump Yelp pages. If you have a lil free time, get thee to Yelp and call every Trump Hotel a "shithole." "These initial tweets by social influencers about "s***hole" reviews on Yelp serve as an example of passive orchestration of social manipulation through influence," he told CNN.